While the nation’s poverty rate has dipped for the first time since 2006, the actual number of poor people (45.3 million) was not statistically different from the previous year, according to the figures released today by the Census Bureau. Poverty is an issue that deeply divides the American public when it comes to how much of a role government should play in alleviating the problems of the poor. When asked which view comes closer to their own, roughly half of the public (51%) says the “government today can’t afford to do much more to help the needy,” while 43% say “the government should do more to help needy Americans, even if it means going deeper into debt,” according to a Pew Research Center survey conducted earlier this year. There are significant divisions on this question by income. Among those with annual family incomes of $50,000 or higher, a majority (59%) say the government can’t do more to help the needy, while 36% say the government should do more. There is no statistical difference on this measure between the highest income Americans (those making at least $150,000 a year) and those who earn between $50,000 and $74,999. Again, responses differ by income. About four-in-ten (37%) of those with incomes of $50,000 or more say that poor people have hard lives; among those with incomes under $20,000, about two-thirds (65%) say this. On these two questions – whether the government should offer more help to the needy, and whether the aid goes far enough – Americans also are split along partisan lines. For example, 73% of Republicans say the government can’t afford to do much more to help the needy, while just 32% of Democrats say this. Among the most affluent Americans (those with family incomes above $150,000), party may trump income when it comes to views about the poor. High-income Democrats (those with family incomes of $150,000 or more) are among the most sympathetic to the poor. About three-in-four (73%) say the poor have hard lives, a share that is higher than among Democrats of lower incomes. By contrast, strong majorities of wealthy and middle income Republicans (those with family incomes of $50,000 or higher) say that the poor have it easy, with more than seven-in-ten holding that view. 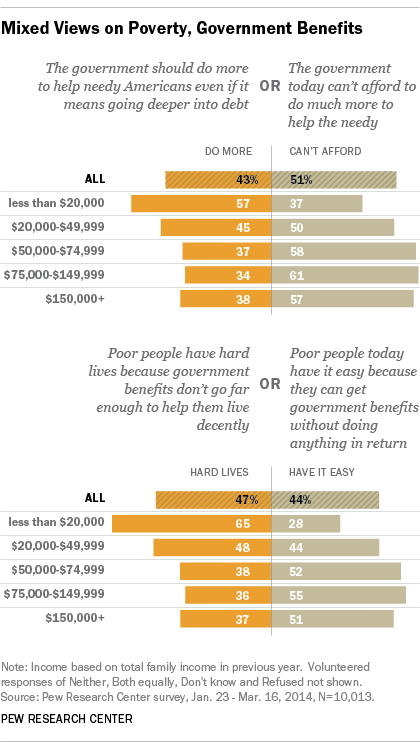 Lower income Republicans (with incomes under $20,000) have a distinctly different view on this issue: only 45% say the poor have it easy, while fully 50% say the poor have hard lives because government benefits don’t go far enough.